There is an intense power when a person looks at you while speaking. That direct gaze is often lost when a person is being interviewed on a camera. The person will tend to look at the interviewer asking the questions and not directly at the camera. We are remarkably attuned to where other people look. The human eye/brain can detect the shift in another person’s gaze of less then a degree. When a person is not looking directly at us — even by fractional degrees — we notice this. Thus its very hard to get a person being interview to look 100% at the camera, even if the interviewer is sitting very close to the camera, which they often do. Errol Morris, the legendary documentary maker (see his famous Thin Blue Line as an example), was desparate for a full-on interview position so he modified a teleprompter into what he calls the Interroton. 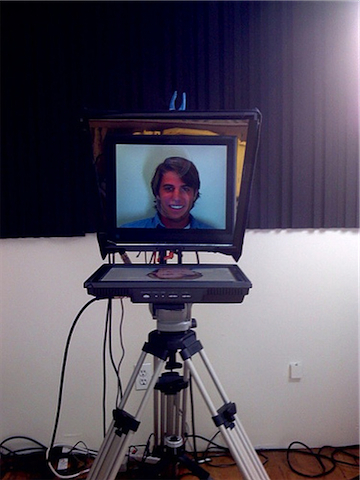 As you can see from this picture of an Interroton taken by blogger Jason Kotkke who wrote about being interview with one of them, a half-silver mirror angled at 45 degrees will reflect the live video image of the interviewer (the guy shown here), while at the same time allow the video camera behind the face (not visible from the front). The whole ungainly set up is not very hard to cobble together. You’ll obviously need two cameras. Ideally the device would be symmetrical. You’d have an indentical mirror device on the interviewer end, so that he/she is also looking directly into the camera for the benefit of the interviewee.